Texting and driving is now widely recognized as a potentially dangerous distraction for drivers. In New Jersey, it is no longer just the distracted driver using a cell phone who can get into legal trouble for a car crash; the person on other end of the phone sending text messages to the driver can also be held liable. This novel legal theory issued by a New Jersey appeals court gave a boost to States’ legislative efforts to crack down on those who use a cell phone while operating a motor vehicle. In September of 2009, 17-year-old Shannon Colonna was exchanging multiple text messages with her 18-year-old boyfriend Kyle Best while he was texting and driving. Within a minute of receiving a text message from her, Best drifted over the center line of the road and struck two motorcyclists head-on. David and Linda Kubert were severely injured in the crash, each losing both of their legs. In their lawsuit, the couple included Colonna because they thought she was responsible for their pain and suffering, treating her like an electronic presence within the car that willfully distracted Best while he was driving. The court did not find Colonna ultimately liable because there wasn’t enough proof that she knew Best was driving while she was sending text messages. However, the court did find that the argument was not without merit. 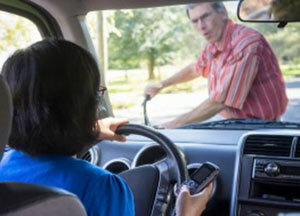 In the opinion, (Kubert v. Best, MRS-L-1975-10, Superior Court of New Jersey) the court stated, “We conclude that a person sending text messages has a duty not to text someone who is driving if the texter knows, or has special reason to know, the recipient will view the text while driving.” In other words, a person sending a text message from another location to a driver who the person knows is likely to read text messages while operating a vehicle may be liable for the consequences. The ruling has many wondering if states will move to outlaw text messaging someone who is driving. It has also prompted many within the legal community to reconsider the scope of possible liability in a personal injury suit where texting is involved. If you have been involved in a car accident in Oklahoma and have questions about what your options are, contact an experienced Tulsa auto accident attorney at the Wirth Law Office for a free consultation today at (918) 932-2800 or toll-free at (888) WIRTH-LAW. If you prefer electronic correspondence, simply submit your question through the form at the top right-hand side of this page and an experienced personal injury attorney will promptly respond.